Over on his blog 'Radio for Everyone' author Akos has uploaded three new posts. The first shows how to cheaply weatherproof antenna connections by wrapping electrical/plumbing tape around the connection. He shows and example with the FlightAware ADS-B antenna. The second post is a review of the relatively new NooElec Nano 3, which is a small form factor RTL-SDR that comes with a TCXO and metal case. Akos shows how the form factor is good for using it with Mobile phones. Akos opens the unit up and shows us how the unit is sandwiched inside the metal case with two thermal pads for improved heat dissipation. Later in the review he also discusses the MCX connector, TCXO and heat. 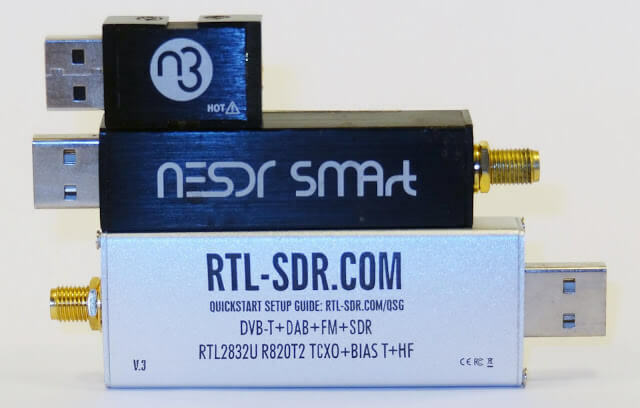 The third post compares three commercially sold antennas at ADS-B reception. The compared antennas are the FlightAware ($45) and Jetvision ($90) ADS-B antennas as well as our RTL-SDR Blog general purpose dipole ($10). The results show that the Jetvision antenna performs the best followed by the FlightAware and then the dipole. However we note that Akos has incorrectly used the dipole as he did not orient it as a vertical dipole.